records the crowds of voices that fill the iconic Melbourne Cricket Ground (MCG). Beginning in the thick of the action, it traces their lines of flight upwards and outwards, throughout the surrounding public space and on into the suburb of Richmond. A body public. “Ponsford Stand, ground level seating bank, MCG” opens up the collection as if to show the crowd’s anticipation for what follows. On “Metal barrier separating the MCG’s southern thoroughfare from rail yards” Martin Kay removes the direct sound of the crowd as he dives deeper into the inner workings of the stadium’s origins. While the crowd is still audible Martin Kay seems to shift away from their immediate connection to the space. 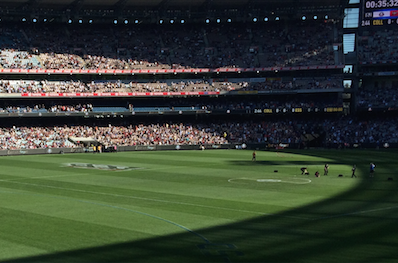 Representing the silence that consumes the stadium during most of its time is the drone of “MCG elevator”. With “Metal fencing separating a nearby tennis court and the MCG” Martin Kay opts for near-silence as the auditory bliss of the piece is apparent, with hushed tones resembling some of L-NE’s best work. This mood continues until the latter half of “Bridge crossing the Flinders rail yards, East Melbourne” where the ghostly aura of the audience can be heard in the periphery. Isolationist drone defines “Iron Fence Separating Batman Avenue from the banks of the Yarra River” by far the best track on the album with a contemplative hue to it, as its naturalistic sound becomes impossible to fully pin down. Closing the album down on a reverent note is the lovely “Saint Ignatius Church, Richmond”. Martin Kay’s “Stadium” represents field recordings at their absolute best: masterfully edited, curated, and amplified to show that music is always all around us. Martin Kay is the Australian sound artist who came our way in 2014 under his Mountain Black alias. That release, Closing In, was a baffling and inscrutable piece of sound art, which may or may not have been based on field recordings. Today’s record, Stadium (AVANT WHATEVER 018), is very much based on field recordings and is also highly site-specific; it was created at Melbourne Cricket Ground, and concentrates mostly on voices. Come to that, voices are the conceptual thread running through the work, starting with the sounds of the crowd of cricket fans enjoying the game, but also including fragments of individuals, e.g. families out for the day chatting to each other, and on one track, the mechanical voice of the lift which takes the spectator from one level to another. He’s so intrigued by the workings of the building itself (a trope used by some other field recordists, though not as widespread as you might think) that he even records the ventilation system and starts exploring fences, railings, and various obscure parts of the stadium, such as the highest point in the seating bank that a human being can reach. At all times, the voices are audible – but often at a distance, or filtered through the layers of mechanical sound, or muffled by the surrounding architecture.Kay then proceeds to follow his nose (or his ears), and takes his mics outside the stadium and into the local suburb of Richmond in Melbourne. In so doing he gets to a nearby railway station, a living room, the Yarra river, and a church – which is where the record finishes. Kay’s explanation is that he is following a “trajectory”, and that he “traces their lines of flight upwards and outwards”; he seems to be saying that the sound of these voices carries everywhere, and that if you live in Richmond there is virtually no escape from the haunting tones whenever a match is being played, so it must be hell for non-cricket fans in the summer (or whenever they play – I have no interest whatsoever in the game). In pursuing this trajectory, it has to be said Martin Kay fetches up in some quite lonely and remote sounding places, and a certain flavour of desolation creeps into these long and mysterious sounds. It may be simply because he’s so far away from the action, but there seems to be a deeper emotional pull at work here. By the time he gets to Saint Ignatius Church, all that ends up on the record is a faintly grim and empty white-noise drone, some of it caused by very distant traffic.At one level Stadium can be read as a decent piece of process sound-art based on field recordings. Its documentary approach is reflected in its utterly prosaic titles, which are short sentences describing precisely where the recording was taken (lacking only a grid reference which Chris Watson might have supplied if he were doing this project). On another level, Stadium tells the story of a simple journey, which takes Martin Kay like a young Odysseus from the “thick of the action” into a quiet and solitary place, one associated with spiritual contemplation. Gradually the sound of the cheering cricket crowd evaporates through this journey, and the traveller ends up alone and far away from the teeming mass of humankind. From 26th September 2016. Stadium is the most recent release from this Australian sound artists & field recordist. It comes in the form of a CDR, and offers up eleven tracks taking-in field recordings captured over a five year period in & around the Melbourne Cricket Ground (MCG) stadium. I first became aware of Mr Kay’s work back in 2014 with the excellent All Things Metal( on 3leaves )- which saw him offer up a selection varied, and often creative field recordings made in & around metal made items/ settings. And the last time I heard something from him was last years Courtyards- which( as it title suggests) featured recordings taken from various courtyards locations in Paris. I guess you’d say this new release follows on the more esoteric & concept focus of the Court yard release- as the eleven tracks here are all about capturing certainly sonic spaces, and how sounds happen, behave, and carry in those spaces. With the compositional arrangement of the albums track traces a linear trajectory from the centre most ring of the ground right through the far reaches of the stadium’s surrounding neighbourhoods, where the cheering dissolve beyond the fringes of audibility. The ｒｅｌｅａｓｅｓ recordings starts at one of the main central stands in the stadium, ending in the suburb of Richmond some 3km’s away from the stadium. As you’d imagine the start of the work finds all the sounds of the stadium very up-close, centred, and full-on. And as the disc carries on the noise of the stadium slowly dies back, to become a distant roar, with other sounds( people talking, bird sound, movements sounds, trains, etc) taking a more central role. If this whole concept/ idea sounds a little flat & unappealing, Kay does often managed to pick relatively worthy places to stop off in his compositional trajectory- going from the grounds elevator, up though the grounds ventilation system, onto the highest point in the stadium. Then at set spots away from the stadium, like a drainage system, a residential living room, rail yard, and near a church. Also where some of the tracks are fairly lengthy( the longest been nearing nine minute), Kay knows where to cut the tracks at the right place, so they keep your interest, and( mostly) never really become tiresome. Australian sound artist and designer Martin Kay works on audio-montages and compositions that explore the intersection of architecture, psychoacoustics, social-dynamics and place. As a sound designer works on sountracks and carry through exhibitions and performances in Australia and overseas. He has released four albums and make appearances in several compilations. This is his second album this year and the last one “Courtyards” was reviewed on loop last april. On "Stadium" Kay he “records the crowds of voices that fill the iconic Melbourne Cricket Ground (MCG)”. Also in the public spaces and the suburbs of Richmond. Each of the tracks is a place in the stadium, as the ventilation system, the bench seats at ground level, elevators, residential living room, the Saint Ignatius Church and a drainage system below some streets. The voices of the crowd have no special treatment, resonating in different environments, in small spaces, open or within a sewer system and other noisy spaces. Kay explores noisy environments but also delves into the silence with sounds on the verge of being inaudible. Martin Kay w 2013 roku opublikował płytę „Closing In” (Moozak) jako Mountain Black, którąrecenzowałem na łamach Polyphonii. Teraz Kay wydał album „Stadium” (25.07.2016 | Avantwhatever). Artysta pracował nad tym projektem przez ostatnie pięć lat, a jego punktem odniesienia jest masowy doping ludzi uczestniczących w meczach na słynnym stadionie Melbourne Cricket Ground słyszany z kilku odmiennych perspektyw. Wydawałoby się, że na tym krążku będzie głośno czy intensywnie, a wcale tak nie jest. Oczywiście są fragmenty, gdzie wyraźnie słychać wrzawę ludzkich okrzyków, ale przewodnim motywem jednak są tu dźwięki na pograniczu słyszalności uzupełniane field recordingiem. Kay rejestrował odgłosy nie tylko w samym środku stadionu czy na jego obrzeżach, a także wsłuchiwał się w doping będąc w najdalszych zakątkach dzielnic otaczających stadion.